The TR-4C tone receiver is designed to receive tone transmissions from an SSI Model TT-4C tone transmitter. In normal operations, the TR-4C receives four sets of meter energy pulses in a three-wire Form C (K, Y, and Z) or 2-Wire Form A (K and Y) format. While the most common usage of the TR-4C is for energy pulses, it can receive any four Form A or Form C sets of contacts sent by the TT-4C tone transmitter. The input to the TR-4C tone receiver is via either a twisted wire pair or a leased dedicated telephone line. The operation of the phone line may be either directly dedicated or through a one or more central office exchanges. The TR-4C will directly drive up to 1/2 mile of twisted wire pair without additional amplification. The TR-4C accepts tone input levels of -40 dbm to +3 dbm with the normal input being a -11 dbm level. The frequencies received by the TR-4C are quartz crystal-controlled and never need adjustment. 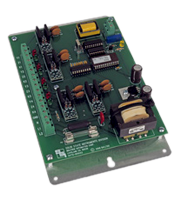 The TR-4C receiver has 4 “dry” (no voltage present) non-bounce Form C solid-state relay outputs. Several TR-4C receivers may be used with only one TT-4C transmitter if it is desirable to deliver a meter’s pulse information to multiple locations not close to each other. The TR-4C’s tone signal input is through a 600 ohm isolation transformer which meets the FCC Section 68 telephone equipment requirements. Bright high-output red, and green LEDs indicate the output status of each of the four “energy” pulse 3-wire relays. A yellow LED shows the status of the transmitted signal into the TR-4C at all times making system checking easy without additional test equipment. When two or more events occur at the transmitter at the same time, the TR-4C will replicate the timing without a transmission sequence timing distortion. The input and output terminal strip is a EURO type offering excellent electrical insulation. MOV Transient suppression for the solid-state relay output contacts is provided internally. Signal: DTMF tone signal from a TT-4C using a telephone leased line or a twisted wire pair should be between -40 dbm to +3 dbm. The input signal level may be adjusted by means of a variable resistor on the TR-4C. Output: Four sets of dry Form C (K, Y, & Z) for energy pulses. The contacts are solid state relays rated at 250 VAC/VDC @ 350mA MAX, 2 amps break, 5 amps carry. The maximum power rating of the contacts is 50 VA. Factory fused at 1/4 amp (3AG).